"A canine corneal ulcer (ulcerative keratitis) is caused by a wound on the outer surface of the eye. It is one of the most common eye diseases in dogs. Signs of eye problems include eye discharge (tearing, thick secretion), rubbing the eyes, squinting, or changes in behavior. The eye surface may also be discolored. As the disease progresses changes in the eye can prevent light from entering, slowly blinding the dog. Early detection and treatment is necessary to avoid infection, chronic eye disease, and to determine if the eye can heal by itself. Some perforations can continue to get larger causing the need for surgery." 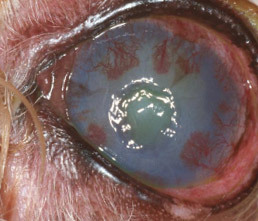 A corneal ulcer is a wound on the surface (called the epithelium) of your dog's eye and possibly in some of the surrounding connective tissue (stroma). This surface covers the cornea and protects it and the other layers of the eye. The other affected parts of the eye are called the endothelium which is a single layer of cells that keeps the cornea hydrated for optical clarity, and Decemet's membrane, which is a tissue that protects the eye from injury and infection. A healthy cornea is clear, however in a dog with a corneal ulcer, the eye becomes opaque and blocks light from entering the eye. The ulcer causes the epithelium to erode into the stroma. The cloudy appearance is caused by a tear. Lesions on the eye can be painful since the epithelium is full of nerve receptors. When a wound forms or the surface of the eye becomes damaged, the eye is no longer completely protected. This allows infections to form. The infections worsen the condition and cause a perforation to form. Infections tend to be viral, vs. bacterial or fungal. The key to treatment is to provide the best condition possible for the eye to naturally heal. Simple epithelial abrasions do not take as long to heal as Stromal ulcers. Trauma-induced uncomplicated stromal ulcers should heal in one to two weeks. Superficial corneal abrasions should healed in less than one week. 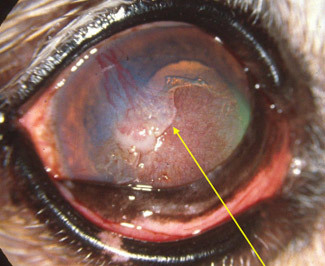 A corneal ulcer in dogs might be referred to as being "complicated." This means that there are factors present that do not delay normal healing, but can cause additional deterioration of the cornea. Factors that can cause additional deterioration include sepsis. 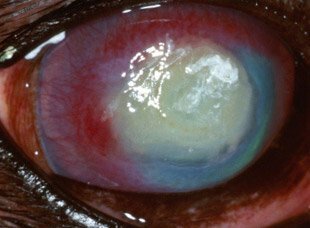 Septic ulcers (bacterial infection) can also cause cataracts or uveitis (uveitis is an inflammation of the uveal tract, which lines the inside of the eye behind the cornea). Foreign Body: Debris such as grass seeds can stick to the eye surface or become trapped behind an eyelid. Bacterial Infection: If bacteria causes the formation of an ulcer, it can be treated with antibiotics. Irritation from External Factors: Dirt or ingrown eyelashes can become trapped behind an eyelid. Eye irritation can also be the result of a household chemical or something as simple as a human shampoo. Facial Nerve Paralysis: This disorder can prevent the eyelid from completely closing, making it impossible for a dog to blink. The paralysis can be caused by lesions in the petrous temporable bone (pyramid-shaped bone at the base of the skull) or the middle ear. Other causes include inflammation caused by an injury or surgery. Injury: If a dog gets in a fight, has an accident or something like a thorn injures the eye can penetrate or effect the cornea. The injury can also introduce infection into the eye. Clinical signs of ulceration include pain, tearing, and discharge. Corneal ulcers in dogs are diagnosed by dropping a stain in the eye (called fluorescein) which will help him or her see the ulcer. The flourescein is an orange substance that under blue light will reveal damage to the cornea and any foreign bodies that might be causing harm. Other tests include cell cultures (histopathology) that are examined under a microscope. During the examination your veterinarian will look for one of the many causes of the condition and to see if your dog is suffering from any other diseases that may be associated with the condition. The location of the ulcer usually indicates the cause. Ulcers on the edges of the eye indicate an eyelash or an object that has gotten into the eye. Lesions or ulcers in the center indicate some type of injury. Your vet will determine if the ulcer is causing pain, if there is eye discharge, and the level of redness. A corneal ulcer is a lesion in the dog's eye in which the corneal epithelium and a variable amount of corneal stroma have been lost. Treatment options vary based on the severity of the ulcer and its location. The goal is to identify and eliminate any underlying cause of the condition. Some ulcers can be treated with prescription medications and will heal by themselves. In this case the greatest danger is your dog trying to rub the eye with his or her paws. In this case you will need to use an Elizabethan Collar to protect the eye. Of immediate concern is the formation of infection. Antibiotic drops are applied every few hours (they only are effective for several hours) or antibiotic ointments that can last longer are used. 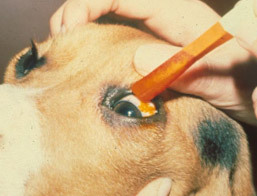 The primary objective of current treatment strategies for infectious keratitis (corneal ulcer in dog eye) is to sterilize the ulcer as rapidly as possible with topically administered antibiotics. If the ulcer is a deep wound (ulcer is greater than 2/3 of the normal corneal thickness) then surgery might be needed to keep a bigger perforation from forming. If bacterial infection is suspected than a topical antibiotic will be needed. An antiviral medication is prescribed if the cause is viral in nature. Some ulcers grow slowly over time (called indolent ulcers) and eat away at the surface of the eye. 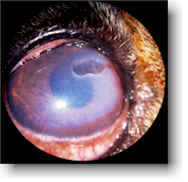 Here intervention is needed by a veterinarian or veterinary ophthalmologist. Surgery is sometimes needed in these cases. Regardless of the cause, the condition should be monitored daily to see if there is any unexpected discharge or redness. It is common for healing eyes to show red blood vessels. Bacterial infection in dog eyes is considered something that needs to be treated on an emergency basis. 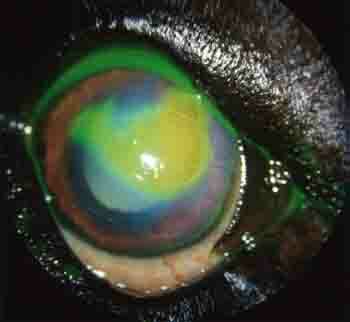 If allowed to progress, the infection can erode through the cornea and continue to Decemet's membrane. If an ulcer progresses to this stage it is referred to as a descemetocele. These "descemetoceles" can rupture, causes a fluid lead and possible collapse of the eye and blindness. To correct an ulcer, in some cases an eye can be saved with surgery. A veterinary surgeon can create a tissue graft, using tissue harvested from the dog's own eye. Other choices are synthetic or biological graft material. Ulcers can cause discomfort and pain. A veterinarian might prescribe a medication such as Atropine to control the pain. The downsides of Atrophine are a light-sensitivity side effect and the bad taste of the medictaion. If a dog tastes it, it can cause drooling and difficulty administering the medication. The prognosis is generally good for uncomplicated ulcers. If there is a secondary cause of the ulcer or the problem is repetitious, then the prognosis is guarded or poor.